And I'm happy to see you are running wihtout the tiny chrome heat shield that goes over the exhaust join (the piece that had the broken bolt removed). I was scared to do the same as I wasn't sure the shield didn't actually prevent parts around it from melting, but I went ahead and installed the pipe without the shield like yours. Nice work, beside being a dynamite welder he is a REALLY GOOD fabricator. 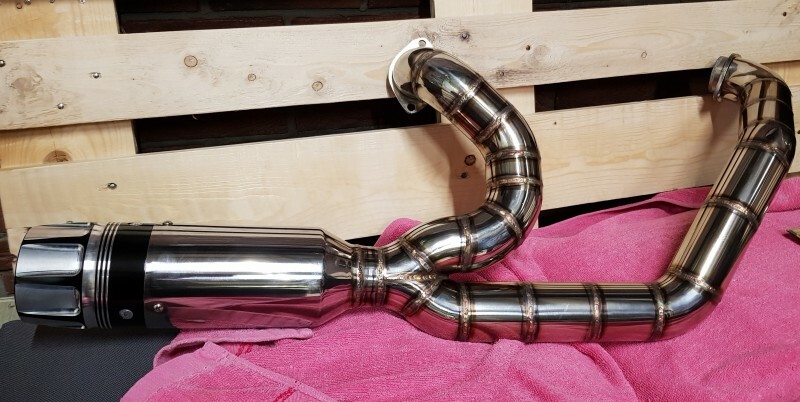 Suggestion: Circle file the stock rear jug cast exhaust elbow (manifold) its a choke point & fab the rear jug pipe direct to the head like the gen 1 Speed Star pipes. DG brings up a good point, fab a heat shield for the rear pipe @ the head area. 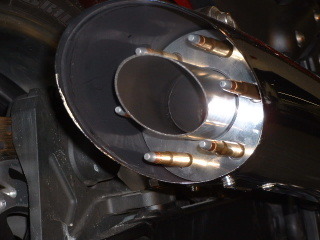 Set up the exhaust tip to accept a cage tail pipe reducer. Changing the tail pipe outlet diameter to a smaller size moves the torque curve down on the rpm curve. With your big bore suggest a 1 & 3/4 ID reducer for a stop light to stop light bike. I ran 1 & 11/16 with a stock bore. My tail pipe reducer can be seen inside the chrome slash cut tip. talked to Rickey about what you said and he totally agrees with you he mentioned that this pipe that I am getting is stepped so it does what you describe with your last post. cant wait man i am very excited! We got a new TEASER! Update! Rickey sent me some new pictures he is putting everything together before he starts welding stuff up! I'm uploading this with my. Phone so hopefully you guys will be able to see this because sometimes I get a error message saying image not available. Alright guys here it is. It's not welded yet but it's pieced together and he's going to add his signature tag and bracket to it. Should get it sometime next week! That looks sweet, can't wait to hear it. I like that a lot! !